General Daily Predictions: Today, the Moon from Taurus forms a hexagon with Neptune in Pisces and a triangle with Pluto in Capricorn. It also opposes the Retrograde Jupiter in Scorpio. Also, from 17:21 UT until Thursday at 5:30 UT the Moon will be void of course. Keep in mind that the three planets affected by the Moon today are in harmonious cooperation amongst themselves. Pluto forms a hexagon with each of the other planets and Jupiter and Neptune are in a triangle. These very long lasting beneficial aspects are active, but not very strongly this period, but with the moon highlighting all of them, their cooperation becomes stronger and more effective, today. I usually say that Jupiter’s aspects, even when they are inauspicious, like today’s, have many blessings to offer. Right now, though, Jupiter is in retrograde motion, so it’s stingy in sharing its blessings. It mostly tells us, “Hold your horses and realise your current situation and blessings. Then decide how to proceed.” It doesn’t tell us, though, to stop our progress. So, yes, there will be some difficulties today, but it’s going to be a good day. The twelve hour long void of course Moon is probably the worst “aspect” of the day, as it discourages new beginnings and new deals. It doesn’t stop us from making them, but it will bring difficulties to them, if we do make them. So, if possible avoid them. Otherwise, though, the void of course Moon, as we’ve seen, neither brings bad luck, nor undoes the good luck other aspects bring. 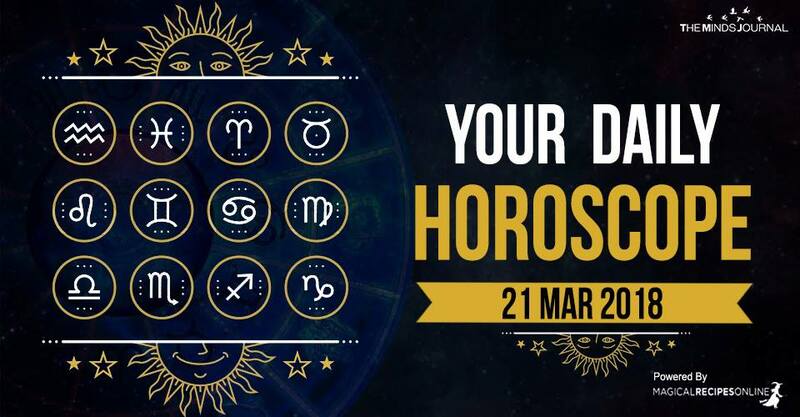 Taurus, Capricorn and Virgo will be the luckiest zodiacs of the day. Scorpio has a very special day. It will face the most stress, but also, if you overcome it, you can achieve magnificent results. Cancer and Pisces will be the less lucky zodiacs. Most things proceed nicely and relatively easily in your day. Work and career matters probably enjoy this aspect the most. Nonetheless, insecurities about your future can appear. In most cases without a concrete cause. Money can also become a little stressful. But about this, too, the way you feel about it is probably worse than the actual circumstances call for. This is a very important day for all your social activity. Promoting yourself, business, dreams and everything you want to promote receives support. Self expression can be demanding and restricted in the same time. Find a way to express yourself. Love life is the one facing the most difficulties, yet progress can happen. You may need to alter your ways, though to make it happen. You magic and your intuition are very capable today. Philtres, potions, talismans and the likes of those can give you good results. Charging such objects today is more than advisable. Also, artistic careers and hobbies receive much support. Both creativity is strong, and success is willing to come. Money can also come, but raise of your fame is more likely.